A positive side effect of the Bradford/Clark anti-smacking bill? 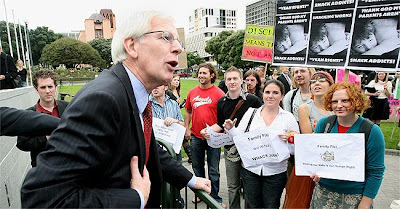 Could United Future leader, Peter Dunne soon be the Jim Anderton of Ohariu? The government has been dealt a blow on the eve of the budget, with United Future MP Gordon Copeland expected to announce today he is resigning from his party in protest at the so-called anti-smacking bill. NZPA understands that Mr Copeland is leaving over Green MP Sue Bradford member's bill to remove from the Crimes Act the statutory defence of "reasonable force" to correct a child. Mr Copeland, a Christian, has always opposed the legislation and while he voted for an amendment stating police had discretion not to prosecute inconsequential complaints he felt the bill still made criminals of parents who smacked their children. He would form the party with former colleague Larry Baldock who has been running a petition against the Bradford bill. The party would be called Future New Zealand - the name of the Christian party which the United Party previously merged with. Mr Copeland is expected to explain his decision later today, but it is believed he will remain in Parliament, creating fresh uncertainty for the government, whose certain majority on legislation has already been removed by the resignation of Mangere MP Taito Phillip Field. Big deal. Just another political parasite. Gravey train is to good to leave the carriage before it gets to a station. in another couple of years he will be another has been. people wont even remember his name. this is a big blow to communism. Copeland is 'on a mission from God'!